Diabetic neuropathy is injury to the nervous system which compromises one of the most common complications among diabetic patients. The damage to the nervous system is caused as the result of high sugar levels in the blood (hyperglycemia), a common situation among many diabetics. This hyperglycemic condition leads to much nerve damage and damage to blood vessels due to free radicals, a state called stress or oxidative stress. Diabetic neuropathy causes much suffering and impairment of the quality of life of diabetic patients. Typical complaints of diabetic neuropathy are, among others, damage to the sensory system (heat, cold, pain), damage to nerves responsible for movement of leg muscles, and damage to nerves responsible for the function of internal organs (reflected in low blood pressure while standing, dizziness and fainting spells). Among the symptoms are heartburn and leg discomfort, ulcers, calluses and infections. Diabetic neuropathy is actually responsible for 50-75% of amputations (non-traumatic) currently performed. Due to the damage to the sensory system, there is danger of wounding or bruising the leg without the patient feeling any pain and, therefore, it is most important for diabetic patients to examine their feet daily and to avoid walking barefoot. High and harmful levels of sugar in the blood and fluctuations in the blood sugar levels, cause the surplus sugar molecules in the blood to react with different materials in the body and the formation of free radicals. This high level of free radicals causes damage to blood vessels, nerves and various tissues in the body. As a result of this process, the peripheral nervous system is damaged. Alpha-Lipoic acid is a unique nutrient of major importance as a strong antioxidant agent. Alpha-Lipoic acid takes part in energy producing processes through metabolism of carbohydrates (sugars) and fat in the mitochondria - "the cell energy plant", which enables the existence of Krebs cycle. Normally cells absorb Alpha-Lipoic acid, reduce it to Dihydro Lipoic acid and secrete it back to the blood circulation. This reduced form of Alpha-Lipoic acid of especially high antioxidant potential, neutralizes free radicals and even reduces vitamins and other antioxidants in the body (glutation peroxidase) from their oxidized form to their active (reduced) form. Alpha-Lipoic acid in both forms can create stable structures (chelation) with transition metals, such as iron and copper, which in themselves are catalysts for oxidation processes. Moreover, Alpha-Lipoic acid is used to treat heavy metal poisoning and in detoxification processes. Due to the fact that the Alpha-Lipoic acid is a small molecule and due to its special structure, it is soluble both in an aqueous phase as well as in a lipid phase and can therefore penetrate into every system in the body. The Alpha-Lipoic acid is valuable in treatment of diabetics due to its powerful antioxidant effect, which provides protection during oxidative stress. High blood sugar levels cause increased production of free radicals, oxidative stress and glycation situations, during which sugar molecules attach to proteins in the blood and hinder their function. Treatment with Alpha-Lipoic acid leads to improved sugar metabolism, a decrease in glycation of proteins and improvement of blood flow to the peripheral nerves, and even promotes rehabilitation of nerve fibers. Moreover, Alpha-Lipoic acid contributes to the enhancement of cell sensitivity to insulin and assists in increasing efficiency of absorption of glucose by cells. As it is a completely safe nutrient, it can be administered in high doses for treatment of diabetic patients, in order to improve absorption of sugar into cells and treat diabetic neuropathy. Two major studies, one from 1999 and the other from 2004, examined the efficacy and safety of using Alpha-Lipoic acid in patients with type 2 diabetes suffering from polyneuropathy and neuropathy symptoms. The study groups were given 600 mg Alpha-Lipoic acid or placebo for three weeks. Throughout the study, neuropathy symptoms, such as pain, burning and tingling sensation, were tested. The results of the two studies showed and proved that Alpha-Lipoic acid, administered at a dose of 600 mg, improves the symptoms and deficiencies caused by polyneuropathy, without causing side effects. The results of the 1999 study demonstrated a decrease in all symptoms in the feet from study initiation to its termination. The results of the 2004 study proved primary improvement in all symptoms after 8 days only! From the studies' conclusions it can be derived that a daily intake of 600 mg of Alpha-Lipoic acid is safe and significantly improves the symptoms and deficiencies of neuropathy among diabetic patients suffering from polyneuropathy. Every diabetic, especially if not controlled, may develop diabetic neuropathy. Among those suffering from the disease for 25 or more years the incidence of the phenomenon is approximately 50%. The best way to prevent diabetic neuropathy is to maintain controlled blood sugar levels, observe a balanced diet, regular physical exercise and intake of antioxidants, and especially Alpha-Lipoic acid. 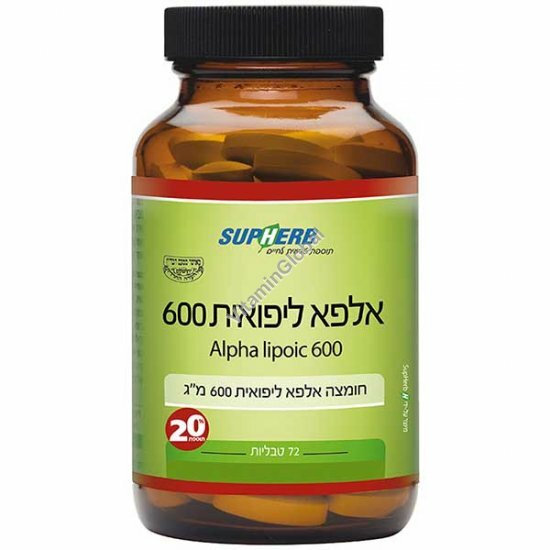 Alpha-Lipoic acid is the only substance in Israel proved to treat diabetic neuropathy and to improve bothersome symptoms (pain, burning, tingling and lack of sensation) after only three weeks of regular treatment. Alpha-Lipoic acid is a powerful antioxidant that neutralizes free radicals which cause diabetic neuropathy and has a high safety profile, and therefore may be integrated with treatment with any other medication. First three weeks: 1 tablet three times per day, approximately 30 minutes before meals. Following first three weeks: 1 tablet per day, 30 minutes before meals. Neuro Guard from SupHerb can be obtained in packages of 72 tablets.